Martins Creek School sits amid a picturesque 61-acre campus. It serves grades Pre-K through 8 and is known as community/family-oriented school. MCS is a Title 1 School with 100% of staff deemed highly qualified according to federal standards. The majority of teachers hold advanced degrees and/or National Board Certification. Martins Creek School has earned much recognition: North Carolina School of Excellence, Top 25 Schools in North Carolina, School of Exemplary Growth, and one of the Top 100 Wired Schools in the nation by PC Magazine. Recently, the State Superintendent identified MCS as a NC Reward School based on three consecutive years of high student achievement, an honor received by only 25% of state schools. For three consecutive years, MCS achieved both Gold Level status in national Math Counts competition and won the coveted Sportsmanship Award for the Smokey Mountain Middle School Athletic Conference, also winning the county middle school Battle of the Books competition for two years running. The growing student population participates in a wide variety of enrichment opportunities, including elementary and middle Battle of the Books, online classes for high school credit, Civic Oration, Math Counts, chorus, Lego Robotics, Science Olympiad, Sustainability Club, overnight field trips, archery, marksmanship, volleyball, cross country, basketball, softball, baseball, track, and more. The 21st Century Learning program is available after school for eligible students. The Parent Teacher Organization and volunteers play a vital role at MCS, logging thousands of volunteer hours at the school. Parents are always welcome and are seen volunteering daily. Martins Creek School is the site of a 1-megawatt solar array, one of the largest in the southeast. Its 4,000 Polycrystalline modules produce enough energy to prevent the burning of 75 tons of coal per day, an estimated 1.3 million kilowatt-hours each year-- enough to power more than 150 homes. The entire school district benefits from this energy savings. To make things easier for families, the only supplies parents need to provide are a backpack and clean pair of shoes for P.E. activities. We have backpacks available if there is a need. 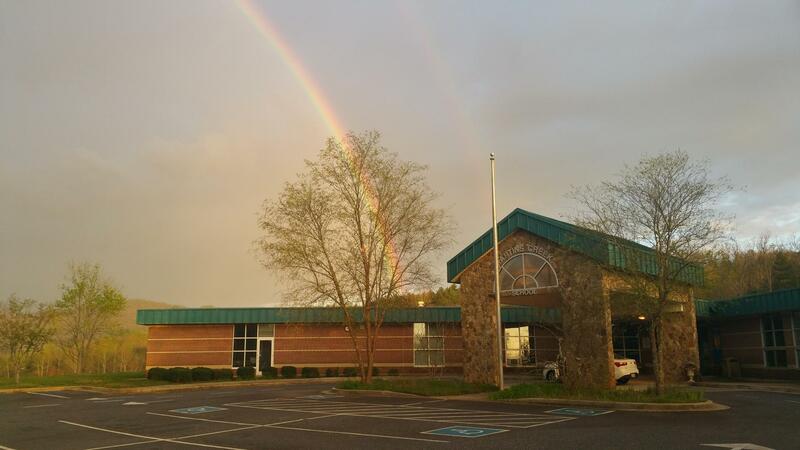 Please contact Paul Wilson, Principal, for more information about the school or enrolling your child, at 828-837-2831. We look forward to hearing from you! Martins Creek School sits amid a picturesque 61-acre campus. It serves grades Pre-K through 8 and is known as community/family-oriented school. Martins Creek School has earned much recognition: North Carolina School of Excellence, Top 25 Schools in North Carolina, School of Exemplary Growth, and one of the Top 100 Wired Schools in the nation by PC Magazine. Recently, the State Superintendant identified MCS as a NC Reward School based on three consecutive years of high student achievement, an honor received by only 25% of state schools. MCS is a Title 1 School with 100% of staff deemed highly qualified according to federal standards. The majority of teachers hold advanced degrees and/or National Board Certification. For three consecutive years, MCS achieved both Gold Level status in national Math Counts competition and won the coveted Sportsmanship Award for the Smokey Mountain Middle School Athletic Conference, also wining the county middle school Battle of the Books competition for two years running. The growing student population participates in a wide variety of enrichment opportunities, including elementary and middle Battle of the Books, online classes for high school credit, Civic Oration, Math Counts, chorus, Lego Robotics, Science Olympiad, Sustainability Club, overnight field trips, archery, marksmanship, volley ball, cross country, basketball, softball, baseball, track, and more. The 21st Century Learning program is available after school for eligible students. The Parent Teacher Organization and volunteers play a vital role at MCS, logging thousands of volunteer hours at the school. Parents are always welcome and are seen volunteering daily.